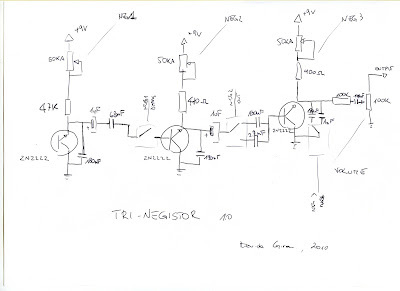 This box I present here is a triple negistor oscillator. This is basically a noise box I use to make sounds. The orignal schematics cames from Charlie Barth trinegistor, you can find it here http://moosapotamus.net/trinegistor.html. I just change some components and add a few switch to his schematics. First of all, what's a Negistor? It's a a NEGative dIfferential resistance oscillaTOR, it's an oscillator built using his NDR effect. The negistor I use it's build using a 2N2222A NPN transistor wired in reverse mode. Please find more information here: http://www.keelynet.com/zpe/negistor.htm. 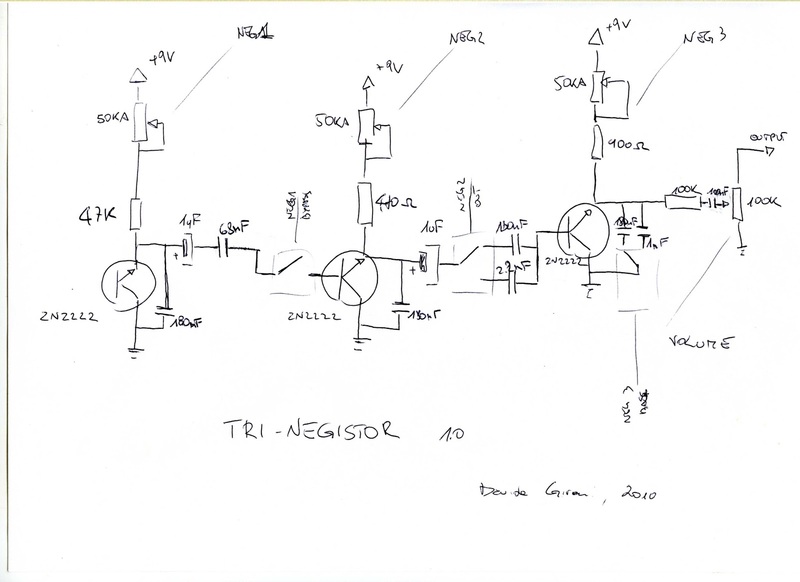 The tri-negistor is built putting in series three negistor oscillator.